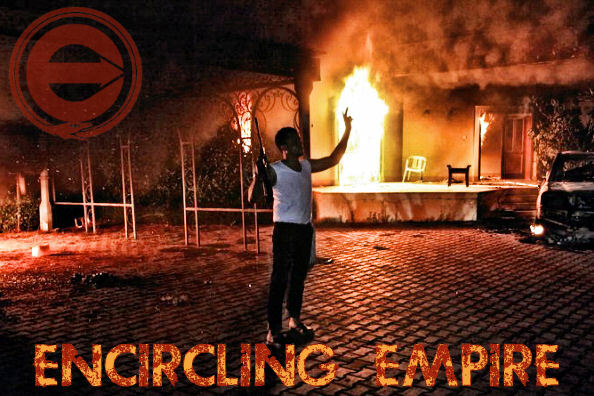 Encircling Empire Reports is a selection of essays, blog posts, and news reports covering a given time period, providing links and representative extracts or key passages from each resource, usually focusing on certain countries/continents and/or processes in each report. 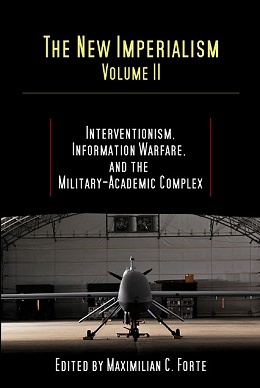 The focus of the reports ranges from imperialism discussed in broad strokes, to specific facets of imperialism: militarization and militarism; militainment; “humanitarian intervention” and the “responsibility to protect”; regime-change; nation-building; counterinsurgency; state terrorism; the economics of empire; soft power, psychological operations, and strategic information operations; and, the ideologies and moral constructions of contemporary imperialist thought. 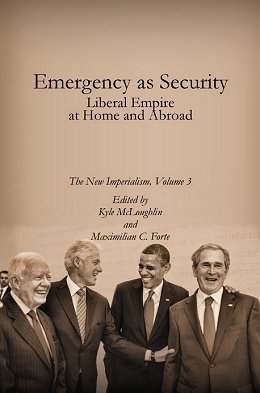 In keeping with the dualistic theme–the empire that encircles us, and the encircling of empire by resistance and collapse–we also attempt to provide coverage of anti-imperialism, anti-war struggles, and the direct resistance against imperialist intervention, as well as covering the decline of U.S. and European geopolitical hegemony. 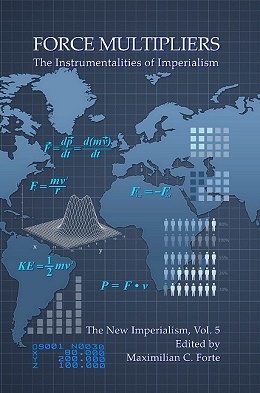 This report covers the period from September 5 to September 23, 2012. 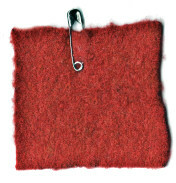 “In Quebec It’s Official: Mass Movement Leads to Victory for Students,” Common Dreams, September 21, 2012–after hundreds of daytime marches and very innovative and clever protest actions, after all the great theatre, after dozens of nighttime pots-and-pans banging sessions that sparked popular protest, a protest movement of hundreds of thousands in a “province” with a total population that is still less than three-quarters that of New York City, this was North America’s biggest protest movement of 2012. It was largely sidelined by Occupy Wall Street, and yet unlike OWS, it won. The experience also shows that the state still matters, as do top-down political organizations such as political parties, trade unions, and some student organizations. No wandering “consensus” here that produces no effective demands. Aside from the above, nothing beats being a professor in the Nation of Quebec at these times, when the university is itself the frontline and focus of action, and the general student population is probably North America’s most politically conscious, astute, and critical. Is it a surprise then that ZA itself was created in Quebec? If, like me, you live in relative comfort in a rich country, and your attempts to change the world are limited to ‘safe’ (and generally pretty ineffectual) activities such as writing, demonstrating, ‘online activism’, making music, making films, etc, then you should probably think twice before branding people or movements as ‘sellouts’. Take that, Abu Whatever! We’re now teaching your girls how to skateboard, and right in the face of the Buddha statues you destroyed. Yeeeah, now we’re even! In this ridiculous story of–believe it or not–an actual NGO called “Skateistan,” we find wandering, bored, idle American skateboarders who joined the bandwagon of those who cash in on U.S. imperial war. There is actually not much more to say about “Skateboarding in Kabul: Half-pipes and headscarves in the Hindu Kush” (Foreign Policy, September 7, 2012), except that it’s no wonder that “foreign civilian aid workers” periodically come under direct attack by the resistance. I would want them out of my country too, or at least off of its sidewalks. Camp What? Camp “BASTION”? Not any more. “Philip Hammond: it’s difficult to defend Camp Bastion from Taliban,” The Telegraph, September 17, 2012: Despite its extensive garrison, numerous fences and remote location, Mr Hammond admitted that defending the base is highly challenging. “It is difficult to defend a site of this size, particularly when faced with a suicidal attack,” he said. “Taliban fighters wore US Army uniforms in attack on Prince Harry’s base,” The Telegraph, September 16, 2012. Panetta’s success mantra, however, is called into question by the decision earlier this week that, at least temporarily, NATO operations with small-sized Afghan units are no longer routine, and will require the approval of the regional commander. Until now, coalition troops routinely conducted operations such as patrolling or manning outposts with small units of their Afghan counterparts. 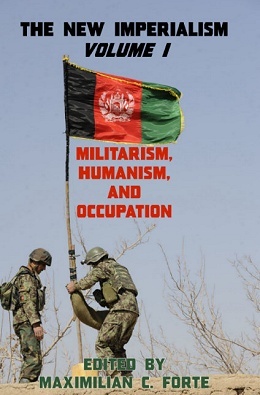 But a growing wave of in so-called insider attacks in which Afghan Army and police troops, or insurgents dressed in their uniforms, have been turning their guns on U.S. and NATO forces, has shaken the trust between the allied troops and the Afghans they are there to train. Missing the obvious: Afghan forces are precisely taking the lead for their own security, and defending their country from dangerous, armed elements, when they turn their guns on U.S. troops. “Six British and US troops killed in latest ‘green on blue’ attacks,” The Telegraph, September 16, 2012. At least eight Afghan women were killed today by a NATO airstrike as they gathered firewood in the mountains of Afghanistan’s eastern Laghman province, NATO and government officials said. President Hamid Karzai condemned the killing of eight civilians and wounding of seven others and ordered an investigation team to probe the incident, his press office said in an e-mailed statement….Some of the dead were brought today to the provincial governor’s office by family members. “They asked for justice from the governor while shouting ‘death to America’,” Sarhadi Zewak, the provincial governor’s spokesman, said in a phone interview. In fact, one of the lead reporters, Paul Raffaele had also worked previously as a writer for the Smithsonian Magazine in the U.S., and the website for the report openly advocates on behalf of a NGO that has lobbied the Brazilian Congress to pass a law that would permit the genocidal act of removing children from tribes such as the Suruwaha, and the filmmakers have also allied themselves with an evangelical missionary organization called JOCUM or “Youth with a Mission”. Humanitarian abduction, with children as objects…remember that? The report and accompanying text and blog repeatedly claim that the Suruwaha are a Stone Age people, and that to visit them is “literally to time-travel back 10,000 years.” The Suruwaha are, apparently, “some of the last survivors of a time way beyond historical memory, thousands of years ago.” They live “caught in some kind of bubble of thousands of years ago.” Language of this sort perpetuates deeply engrained notions that isolated tribes are primitive, that they somehow lag behind the rest of us in their evolutionary development, and that they are our inferiors. We help tribal peoples defend their lives, protect their lands and determine their own futures.This may be good for audience ratings but is dangerous nonsense. It stokes the fires of prejudice that still pose a major threat – perhaps the major threat – to the welfare of forest dwelling Indians across South America. In a similar vein, the programme makers have gone to great lengths to persuade the viewer that the Suruwaha are a “lost tribe” living in a “lost world”. This is no doubt why, for example, they are supposedly intrigued by the “books, boots and modern technology” that the crew have brought with them. …. The true position is that the Suruwaha have had regular contact with both governmental and nongovernmental organizations since the early 1980s. They have had axes, machetes, torches and other equipment for years. Aguniu, who features prominently in the film, has flown in aeroplanes, as have many others. About half of all living Suruwaha have at one time or another visited cities like Lábrea, Manaus, Brasilia and Rio de Janeiro. Actually, this is one of one of the world’s most profound no brainers. The Suruwaha already live in the modern world. The only “profound” question for them, as for all of us, is how best they can survive in it…. Corry also takes issue with the allegations of infanticide, and of a tribe that is lawless. Among NGOs, Survival International is one of the very few to have distinguished itself for practice that follows an unspoken motto: “leave them the f*** alone!” We need more of that, and less “anthropology” practiced as an art form of colonial adventurism and humanitarian interventionism. 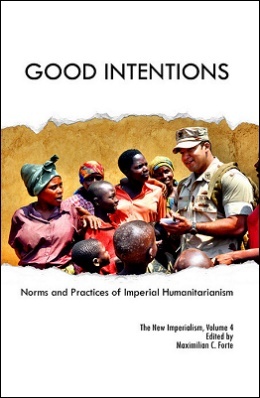 What is also significant about this case is that it makes us revisit the Amazon as one of the original, colonial laboratories of “humanitarian interventionism” aka the “responsibility to protect,” before such labels even existed. In France, according to the government, “freedom of expression” extends only to making bigoted, ethnocentric statements–it’s the response that gets banned. It’s not just the government, as it turns out, that fears protest as itself being a valid form of expression usually protected as a human right. How interesting then that while France condemned Syria for banning peaceful protests (aimed at regime change), France itself bans protests. Interesting thing, this white imperialist attempt at logic. See: “France bans protests over Prophet Mohammad cartoons,” Reuters, September 21, 2012. For news and commentaries on Libya that often differ markedly from what is found on the mainstream media, featuring perspectives supportive of the Al-Fatah Revolution and the Green resistance against the new order imposed by NATO, the Gulf States, and their local collaborators, see the following sites (presented in particular order). These are just some of the sites that preserve the memory of a revolution that transformed Libya from a poor colonial backwater of tin shanties into an independent and defiant nation that promoted a vision of Africa as integrated, self-reliant, and anti-imperialist. Libya 360º–“Even if there comes a time when you do not hear my voice, do not give up. Do not despair. Do not stop fighting for your freedom until you have victory!” ~ Muammar Al-Qadhafi–this site’s featured categories focus on Muammar Gaddafi, the Green resistance, official statements from the Libyan government under Gaddafi, entries on Africa and Imperialism, the “Arab Spring,” and phony “revolutionaries”. Libya S.O.S: Another prolific site that is packed with articles, videos, photographs and documents, focusing in particular on NATO’s intervention and the crimes that were committed during and after that intervention. Wrong Kind of Green: “Long live the Libyan Arab Jamahariya!”–the primary focus of this site, which it pursues with scathing commentary and in-depth analyses, is the role of western NGOs in promoting regime change, U.S. imperialism, and corporate dominance. Beyond Libya, one will find here articles on diverse cases, including Venezuela, Bolivia, and various current destabilization campaigns occurring around the world. Mathaba News Network: Libya–The Mathaba News Network site is likely the oldest one that has brought news and communication from Libya to the wider world. MNN sources a wide variety of articles on Libya, while also benefiting from a network of sources on the ground in Libya. For many years, MNN has functioned as a semi-official international organ of the Al-Fatah Revolution. It promotes a wider network including the International Green Charter Movement, the International People’s Conference Organization, and various publication and communication initiatives. Advance Warnings: “State Dept to Americans: Don’t go to Libya” (Foreign Policy, August 27, 2012): “Carjackings, robberies, kidnappings, and militia violence all are on the rise in Libya, prompting the State Department to warn U.S. citizens to stay away from the North African country, nearly a year after Libyan rebels seized the capital Tripoli from Muammar al-Qaddafi’s forces. Ironically, the State Department resumed full consular services for travel to and inside Libya today, but simultaneously advised Americans the country was too dangerous to visit. Militias are rounding up foreigners with little regard to the actual law or due process and the State Department has little influence with them, the department is warning. Suggestions that Libyan members of Al Qaeda, released from Guantanamo to Libya, were behind the attack on the U.S. consulate in Benghazi. “A blast from the past”: “Bomb targets US embassy offices in Libya’s Benghazi,” Reuters, June 6, 2012–as reported by the U.S. Embassy: A bomb targeted the U.S. embassy offices in the eastern Libyan city of Benghazi late on Tuesday, an embassy official said. He said the improvised explosive device hit outside the gate of the offices and no one was injured. “We have asked the Libyan government to increase its security around U.S. facilities,” the official told Reuters. The main U.S. embassy is in the capital Tripoli. The attack is the latest on international missions and institutions in Benghazi, the coastal city 1,000 km east of Tripoli where the uprising against Muammar Gaddafi began last year and where many overseas bodies station representatives. On May 22, a rocket-propelled grenade hit the offices of the International Committee of the Red Cross in Benghazi, leaving a small hole in the side of the building but causing no casualties. A month earlier, a bomb was thrown at a convoy carrying the head of the U.N. mission to Libya. That attack was the first of its kind targeting a foreign mission since last year’s revolt overthrew Gaddafi….On Tuesday, a U.S. drone strike in Pakistan killed one of al Qaeda’s most powerful figures, a Libyan citizen called Abu Yahya al-Libi”. “UN ambassador: Libya attack was spontaneous”–Susan Rice once again caught spewing without having the facts, ignoring State Dept. mandate to stop talking. Yet Al Qaeda claims it was their revenge: “Al-Qaeda says attack on U.S. consulate in Libya ‘revenge’ for death of its 2nd man,” Al Arabiya, September 15, 2012. It was a terrorist attack: “They were killed in the course of a terrorist attack on our embassy,” Matthew Olsen, director of the National Counterterrorism Center, said in response to a question at a Senate hearing. Did we say it wasn’t a terrorist attack? Because now it is. (In other words, after more Orwellian linguistic torture, and a trial balloon that was shot down, we can admit the basics, maybe, sort of): “It is self-evident that what happened in Benghazi was a terrorist attack,” the White House press secretary, Jay Carney, told reporters aboard Air Force One on Thursday. “Our embassy was attacked violently and the result was four deaths of American officials.”Until now, White House officials have not used that language in describing the assault. But with the election less than two months away and President Obama’s record on national security a campaign issue, they have come under criticism from Republican lawmakers who say the administration is playing down a threat for which it was unprepared….In a highly charged political atmosphere, the mere use of the term “terrorist” is loaded, not least, as one administration official acknowledged privately, because the phrase conjures up an image of America under attack, something the White House wants to avoid…. [but…the attack was totally spontaneous and had to do with the outrage over a YouTube video:] Mr. Carney maintained on Thursday that Obama administration officials still were not calling the attack preplanned.“According to the best information we have now, we believe it was an opportunistic attack on our mission in Benghazi,” he said. “It appears that some well-armed militants seized on that attack as the events unfolded that evening. We do not have any specific intelligence that there was significant advance planning or coordination for this attack.”Secretary of State Hillary Rodham Clinton said earlier in the week that there had been no intelligence warnings that an attack was imminent. …and Ansar al-Sharia denies any role in killing the U.S. Ambassador: “We are against the killing of the ambassador as he has not committed a crime to be killed for but if America uses this as an excuse, Libya will be an inferno for U.S. troops,” Jehani said, adding that his group was “highly” prepared. More internal conflict generated, after months of militias attacking each other: “the military asked all armed groups using the army’s camps, outposts and barracks in Tripoli, and other cities to hand them over. It warned that it will resort to force if the groups refuse”. A dead American, U.S. drones, turning them against themselves, with some familiar anti-protester language reappearing (supposedly that was Gaddafi’s monopoly): “Those you call protesters are looters and thieves,” said Nour Eddin al-Haddad, a young man with an automatic rifle slung on his back. “We fought for the revolution. We are the real revolutionaries.”…If the government doesn’t act, “there will be a second revolution and the spark will be Benghazi,” lawyer Ibrahim al-Aribi. Who organized the supposedly spontaneous, popular anti-militia protests? The Libyan authorities responded to the death of Stevens by organising “Rescue Benghazi Day”, a mass demonstration against militia groups that culminated late on Friday with crowds storming through Ansar al-Sharia offices. Libya, “a state in the making”…let’s not mention who “unmade” it. Weaker and weaker: But in an indication of government fears of a sudden security vacuum without the militias it relies on to keep order, officials called on protesters to respect “legitimate” militias. Shadow play, militias informed, withdraw with their weapons: The group [Ansar al-Sharia], which had vacated its offices in advance and put up no resistance, announced on Saturday that it had evacuated its premises in the city to preserve peace….Although Ansar al-Sharia seems no longer seems to have an overt presence in Benghazi, its departing fighters took their weapons with them. The group and its ideological allies have presences in other towns in eastern Libya, notably Derna, a city to the east that is known across the Middle East as a recruiting hotspot for Jihadists to fight in Iraq, Afghanistan and Syria. Militias melting away? The two main Islamist militias in Derna, a city in eastern Libya known as an Islamist stronghold, withdrew from their five bases on Saturday and announced they were disbanding, residents said, a day after a militia was driven out of Benghazi. The Abu Slim and Ansar al-Sharia militias’ announcements were apparently motivated by events in Benghazi, where Ansar al-Sharia, a group linked with last week’s deadly attack on the U.S. consulate, withdrew from all its bases in the city late on Friday amid mass demonstrations in support of the government. Disbanded? “Rather than join the military, the Ansar militia, viewed as the most disciplined and feared one in the east, said it disbanded on Sunday. ‘Now, we have only light personal weapons,’ said Youssef Jihani, a senior figure in the group.” What these moves have achieved, or tried to achieve, is to create greater difficulty for the U.S. to militarily attack such a moving target, especially one that supposedly dissolves into thin air. Disbanded? No weapons were left behind in most of the seizures, protesters and officials said, suggesting the militias had been anticipating such an event because of a buildup of resentment against them. Wal-Mart for Libya: “Former President Bill Clinton on Sunday challenged Wal-Mart to open a store in Libya and help create jobs in the world’s most troubled areas. “If the new president of Libya asked you to open a store in Tripoli, would you consider it?” Clinton asked Wal-Mart CEO Mike Duke at the opening session of the Clinton Global Initiative. Who needs Gaddafi’s extensive social security state and distributed oil income, when you can have jobs at Wal-Mart. After all, it worked so well for the U.S.
That’s my job! “Obama: Does Romney want ‘to start another war’ in Middle East?”–this rich bit of irony comes from the very same incumbent who has started two new wars in the Middle East (Yemen and Libya), with a third on the way (Syria). Indeed, had Russia and China not vetoed three UN draft resolutions, each of which opened the door to foreign direct military intervention, one wonders how much worse Obama would have succeeded in making the Middle East. But it’s election time in America, and that means any new lie can be told with a straight face, to paint over the established lies. “Former US President Carter: Venezuelan Electoral System ‘Best in the World’,” by Ewan Robertson, Venezuelanalysis.com, September 21, 2012. Finally, some long overdue recognition of the party and the leader that has won the greater number of free and fair elections of any in the Americas, several in a decade, including popular assemblies for a new national constitution, a recall vote, presidential and parliamentary elections. What about the U.S.? “In the context of the Carter Centre’s work monitoring electoral processes around the globe, Carter also disclosed his opinion that in the US ‘we have one of the worst election processes in the world, and it’s almost entirely because of the excessive influx of money,’ he said referring to lack of controls over private campaign donations.